Hello, everyone! I hope all of you are well and had a fabulous week. Today's article is on men's fashion accessories, or more precisely, men's watches, instead of our usual women beauty product review. I've chosen Breitling Watches, a sensational brand with very fashionable and unique watches. Glance down at any known watch brand -- what you’ll find is an endless array of blacks, whites and metallic hues. Now take a look at Breitling watches. (After you pause for a moment because the beauty and finesse of these timepieces have left you spellbound)what you will find here is quite a different picture –blue, is the prevalent colour, as seen on a majority of their dials and bezels and many of the straps, as well. Eternally a class apart, in form or function, Breitling watches always put out a unique style statement. 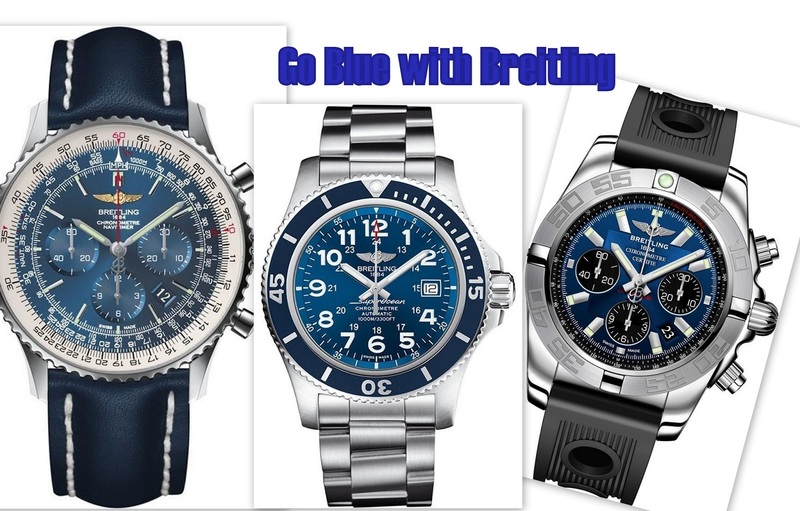 The blue hue, safe to assume, is inspired by Breitling’s tryst with the seas and the skies. What with being primarily aviation and dive watchmakers, Breitling’s legacy lives on in vast, blue spaces. And so it is only obvious that a hint of their heritage has woven itself right into the brand’s design aesthetics –evident in the numerous timepieces that sport a blue tone. While it’s a well-known fact that Breitling is virtually unmatched in terms of technical specifications, you’ve got to know that their design sense is just as brilliant, as you can see for yourself in this model. The chiselled build of the timepiece is a favourite among aviators, and you can tell why –it’s just so fly! The large 46mm dial sets the tone for a bold masculine look. The blue dial is striking to behold, only enhancing the overall appeal of this refined beauty. Suffice it to say, this one’s an absolute masterpiece in every aspect of watchmaking. The Navimeter was originally launched in 1952. It was the brainchild of watchmaking and mathematics that allowed aviators to perform complex mathematics to help in navigation. Basically, the watch doubled up as a calculator –and a beautiful one at that! Since then, the line has evolved beautifully, and this model is testament to not only the collection’s stunning aesthetics, but its immaculate precision. It’s an instrument that’s nothing short of pure genius. The almost-entirely blue overtone is not to be missed! This pro-divers watch can go as deep as 1000 metres and withstand immense nautical pressures, all the while looking as though it belongs on a gentleman’s wrist at a formal business do. The sophistication in design remains perfectly intact in the deep blue. So even if it doesn’t look like your day is going to involve much deep-sea diving, you can strap this versatile ticker on, anytime, anywhere. Though subtle, the Breitling favourite blue hue is still present in this chronograph. Breitling goes chic with this stylish ticker! Embrace this refined look with a sleek strap and a simple dial. Minimal all the way, the clutter-free design makes this timepiece a great choice for formal affairs, yet pulls off a trendy casual look just as gorgeously. Not to forget, the blue strap and bezel are just to die for! They evoke a truly regal aura, and I’d sure love to experience this little royal flavour, wouldn’t you? The many hues of blue mark this one out as a true blue player from the house of Breitling. The Colt collection was actually built especially for military use, and you can see the strength and power in every facet of this piece. The sturdy build is evident in the sleek rubber strap and the hardy dial. The military look and feel is revamped with a modern twist to the material and design that has turned out to look absolutely killer. Topping it all off, the blue adds a touch of legacy to this otherwise quintessential military model. Coming from one of the most legendary collections by Breitling, this ticker is a timeless wonder indeed. So the blue dial does not go unnoticed as characteristic of the brand’s conquests of the sky and seas. Offering functionalities galore, the Navimeter is a keeper for watch-lovers and professionals akin. The linked stainless steel strap keeps the large 46mm dial handsomely in place on your wrist, so you can beam down at the glorious blue beauty anytime you like (while it keeps time accurate to the T, all the way)! The brand’s true blue legacy speaks for itself, but these magnificent pieces remind us just why Breitling watches are so stunning in form and function. Which blue beauty would you choose to adorn your wrist? The brand’s true blue legacy speaks for itself, but these magnificent pieces remind us just why Breitling watches are so stunning in form and function. Which blue beauty would you choose to adorn your wrist, or delight your loved one with as a gift? Don't forget to mention your pick in the comment section.